This freshly-discovered Vincent Black Shadow is ensconced in the workshop of vintage specialist Glory on Hollywood Blvd, LA. “It was found in the Nevada desert after being hidden since the 1970s,” says Glory owner Justin Kell. “I’ll be ripping it apart as soon as we determine the history and decide which way to take the rebuild … It’s going to be a huge rebuild, but a very cool project to do.” In standard form, the Black Shadow could hit 125 mph (200 kph) with just 55bhp from a 1-liter OHV engine, so goodness knows how fast this drag bike was in its original form. 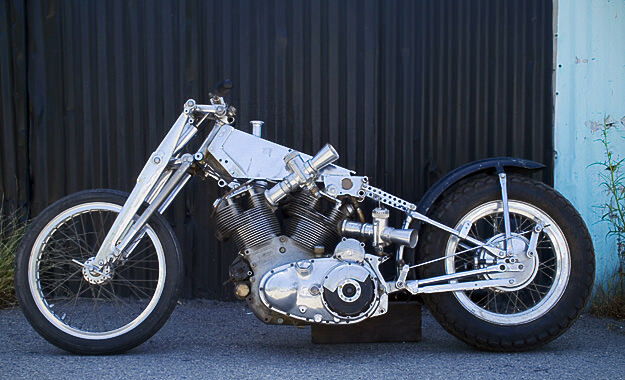 The image is by the artist Coop: see more of this bike, plus a 1948 Series B Rapide, in his photoset.